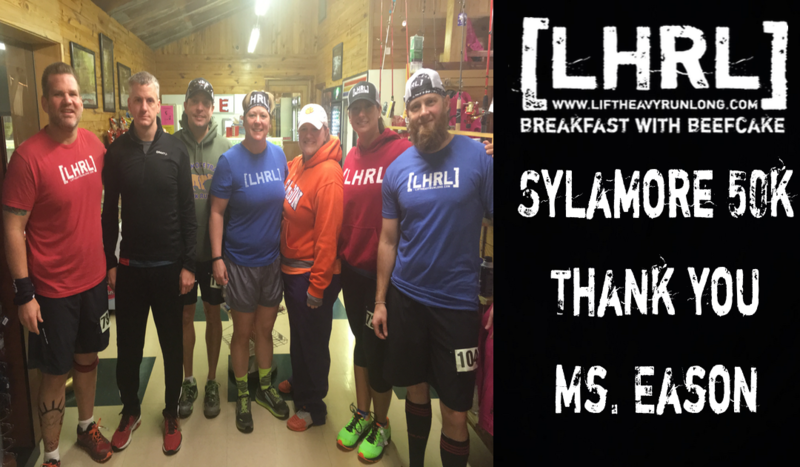 It was another perfect day for the Sylamore 50K trail race on February 18th, 2017. It seems as if every year the weather and conditions are perfect….very “different”, but ultimately, very perfect. I could expend a million words on what I go through in my 31 miles of waddling along the side of that mountain in Sylamore, AR., but I am going to attempt to stay focused. I am going to direct my words on what I thought about most during my experience this year. The subject of this post is an individual who probably has no idea that she has had any sort of effect on my life, at all, whatsoever. She would probably be surprised if she knew that she comes across my mind daily, as I think about the abundance of things in my life for which I am grateful. She would most likely be alright if no one ever brought to her attention the role that she plays in her participation at Sylamore, and the impact which she has on people’s everyday lives. It might even make her a bit uncomfortable to have my appreciation publicly strewn across a computer screen. I could keep it to myself, but I won’t. I will not, because that is not how I choose to do things. I will not, because I am a confident individual, who believes in the importance of sharing what is on my mind. And you, Ms. Eason, have a lot to do with this level of self-confidence, and I am about to tell you why. Ms. Eason, I have some things that I would like to share with you. I asked you, as if there was doubt, but the truth is, I know exactly who you are. I see your face on an almost daily basis. I will never forget the Grace that you showed to me three years ago. Partly, because of you, I am the person that I am today. You see, three years ago, the Sylamore 50K meant everything in the world to me. My entire existence seemed to be hinged upon my finishing the 31miles of Sylamore. I had been clean and sober for about two years and divorced about the same length of time. I had not smoked cigarettes for about a year, I had just begun learning to truly learn to be a daddy to my kids, and I had recently crossed the line from morbidly obese to obese. However, all of the distance that I had traveled was essentially my digging myself out of a hole, that I had created for myself. I had essentially accomplished nothing at this point, except for repairing what I was responsible for breaking. The only things that I had really done, were exactly what people are supposed to do in the first place. My “victories” were what most people do every day. Finishing Sylamore, however, would be a real prize. No sooner than you could get those words from your mouth, my life began to change. Ms. Eason, you have no idea the magnitude of your decision. There is no way of my expressing in words, just exactly how grateful I am that you allowed me to finish the Sylamore 50K in 2015. It is impossible for me to tell you what would have been the outcome, if I had not finished the race that year, but I can imagine that there would not have been a great deal of good to come from it. There were still so many periods of loneliness, and I was still so ashamed and so fragile, that a DNF could have sent me spiraling. Ms. Eason, you had no reason to do it. God only knows that you had already given enough. All of the aid station workers and co-ordinators had experienced a long enough day already, in the freezing cold temperatures. You had every right and reason in the world to “call it quits”, wrap it up, and go have some peace and comfort for yourself. For whatever reason, you found it important to allow me to get some closure in the race along the mountain. You sensed the urgency in the things which were occurring. I just really can’t even begin to explain my appreciation. Fast-forward to this Saturday, at mile 25 of the Sylamore 50K- my life, this race, the weather, and my mental state were all completely different. My physical state? Well, it was exactly the same….I was beat all to hell. But, that’s what we pay for. There’s not a person in the race that thought they were getting hot baths and foot massages, we are there for the shallacking. However, my life was completely different. I was in a different place, altogether, than I was three years ago. This year, I had a little extra time. I could lick my wounds, walk it in, and be “ok” with knowing that I had run out of gas, but would ultimately finish. I walked the last 10miles of the race, and most of those miles were spent in gratitude. I was grateful that I could walk, and I was not injured. I was grateful that I can attempt things like these, and that my self-worth is not based around my finishing time. I was grateful that events like these, are just that, they are events. They are events, where I get to spend an entire weekend getting to fellowship with friends and getting to know one another a little bit better, as well as having time to get to better know myself. I was grateful to know that I could even be pulled from the course, and live to fight another day. I was grateful to have the self-confidence, and self-awareness to know that life is much more important than a race through the woods….but a race through the woods is an important part of my life. Ms. Eason, you helped me to build a foundation. What was once a house of cards, where my entire existence could hinge upon the finishing of a pre-set time and distance, is now a much stronger structure, which consists of a supportive spouse, happy and healthy children, loving friendships, and a relatively healthy lifestyle. Three years ago, Sylamore was my “one turn at bat”. It was the entire ballgame. It was the whole season. It was my everything. Ms. Eason, because of what you did back then, today, it is just another swing in a season of nine inning games. It is an event which allows me to enjoy the life that I am fortunate to live, but in no way, shape, or form, defines who I am as a person. What you gave to me is a real gift. While I realize that it is sad that someone can weigh their entire existence upon finishing a race….it is what it is, and it takes what it takes. You seem to be aware of that. And a thank you to all of the volunteers and supporters who selflessly spend countless hours sitting, waiting, helping, and encouraging folks like me to help waddle it out across the finish line. I’m forever grateful. Wilson, now you know GOD works in mysterious ways we can never comprehend. It is always surprising to me how GOD has worked so many things out for me in my life. I have a life because of HIM. Enjoy everyday and give thanks to GOD for all he gives us.